The highly anticipated fifth book in C.J. Ellisson’s VV Inn series is out now and it’s the book that will be hard to put down. At least that is what happened to me. Whenever I had to put it down though, it was because I had to go to work or I had to go sleep. Yup…let’s just say the minute I finished it I wanted more. In Blood Legacy, C.J. has ALL of her three main characters tell the story in their points of view. We have the ever lovely Vivian (who wasn’t herself, but she still has her tough personality that I love), Vivian’s handsome caring husband Rafe (who proves each time he’s tougher than he seems), and Vivian’s vampire servant Jon (who I’ve always been in love with). Each of them make the story flow very well with telling their side of things. Poor Vivian has gone through a lot from the previous book, so she’s still feeling the effects of what happened. She is out to get the master vampire who tried to harm her and so is Rafe and Jon. Rafe and Jon definitely don’t want Dria going off on her own, so they will do anything to protect her. All three of them are in Buenos Aires to find the master vampire, but they also are in the mix of finding a paranormal serial killer who keeps killing around them. Dria, Rafe, and Jon will search out unlikely characters to help with the search of Rolando and the serial killer. ***The truth will slowly unravel in the end on what is happening and you will be left shocked. C.J. definitely knows how to flow the story very well in each of her books, and builds up the story to an exciting ending. C.J. also knows to keep the reader reading from each chapter by leaving you hanging at the end of each one. Hence, the reasoning behind not wanting to put it down because you want to know what happens in the next chapter and so forth. Be prepared for some very heated moments with Vivian and Rafe in the story too. I love how their love is with each other. =) Also, be prepared for Jon’s moments too. *Sigh* Jon…you’re not supposed to move on with someone else without my permission, dang it. Once you get to the end though, you WILL definitely want more. 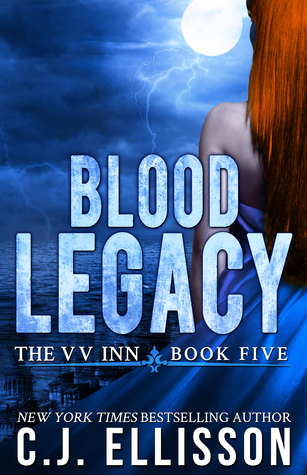 Well….until I figure out what Vivian, Rafe, and Jon are up to next I guess I’ll re-read and re-read the VV Inn series. I need my VV Inn characters. I give this book 5 stars and highly recommend it to PNR/UF readers out there. If you haven’t picked up this series yet, I highly recommend you do.